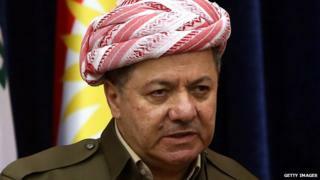 The regional parliament chose veteran Kurdistan Democratic Party leader Massoud Barzani as the first president of the Kurdistan Region in 2005 for a four-year term. He went on to win a presidential election in 2009. The previous presidential election in 1992 produced such a close result between Mr Barzani and Jalal Talabani of the rival Patriotic Union of Kurdistan that the two parties agreed to form a joint presidential council. This fell apart during a civil war in 1994-1997 that saw the region partitioned between their supporters. They became reconciled in 2002, and Mr Talabani went on to become president of Iraq. The two parties have ruled the region together since, although they stood as separate parties at the 2013 parliamentary elections. Opposition groups are highly critical of this arrangement, seeing in it scope for undermining democratic institutions. For example, the KDP and PUK agreed to extend Mr Barzani's term for two years in 2013, to avoid a potentially fraught election, and he has remained in office ever since on the same grounds. Following several years of tense relations with the Iraqi government of Nouri al-Maliki, Mr Barzani raised the prospect in July 2014 of an independence referendum for Iraqi Kurdistan. This was postponed while the central and Kurdish governments cooperated in ousting Islamic State group from areas of western and northern Iraq, especially after Mr al-Maliki was replaced by the less divisive government of Haider al-Abadi. Buoyed by the defeat of Islamic State, the Kurdish government conducted the referendum in September 2017, winning an overwhelming mandate for independence. But the firm response of the central government took Mr Barzani by surprise. The Iraqi army drove Kurdish Peshmerge forces out of important disputed areas like Kirkuk, which the Peshmerga had occupied during the campaign against Islamic State, and Mr Barzani had little choice but to offer to suspend the independence bid. Massoud Barzani was born in Iran in 1946, where his father Mustafa was military leader of a short-lived, Soviet-backed Kurdish republic. The Barzani clan is one of the most powerful political forces in Kurdish politics. He rose to prominence within the PDK at Kurdish autonomy talks with the Iraqi government in 1970. A nephew of the president, Mr Barzani has served as prime minister in 2006-2009 and again since 2012 in a power-sharing agreement between the Kurdistan Democratic Party and the Patriotic Union of Kurdistan. Born in 1966, the son of Idris Barzani, Mr Barzani was rapidly promoted to the KDP's ruling group on the death of his father in 1987.